These gingerbread cookies are as delicious to eat as they are fun to make. I think my kids enjoyed making these cookies even more than sugar cookies this year. Perhaps it's because the gingerbread people seem to have a bit of personality. Use whatever decorations you have on hand. We found red and green striped white chocolate chips and thought they made terrific buttons for these gingerbread men. If you like these cookies, check out my easy soft gingerbread cookies recipe. Decorate them with colored sugar, sprinkles or even icing. In a large mixing bowl, beat the butter and sugar together until fluffy. Add the molasses, egg and vanilla. Beat well. In a separate bowl, sift together the flour, baking powder, baking soda, salt, ginger, cinnamon and cloves. Stir into the wet ingredients until well-incorporated (you can do this with your hands). Separate the dough into three pieces. Form into logs and wrap in plastic wrap. Refrigerate at least 1 hour. When ready to bake, remove dough from oven and preheat oven to 350 F.
Roll dough out to a thickness of 1/4-inch. Use cookie cutters to make gingerbread people. 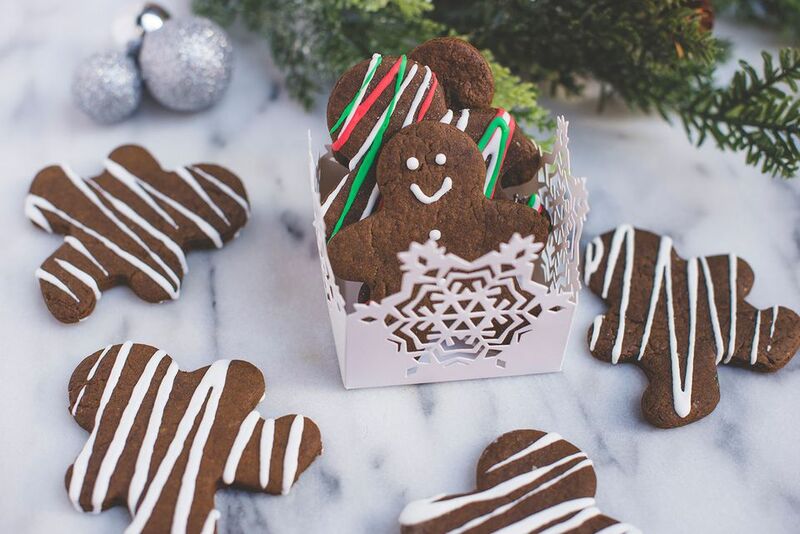 There's something about the flavors of gingerbread that remind us of the holidays. Another quintessential holiday dessert is pie--try Sweet Potato Pie with Whipped Cream, The Best Streusel Apple Pie Ever, or Ginger Pumpkin Pie.